Christian, Muslim leaders join Jordan’s king for Christmas celebration. 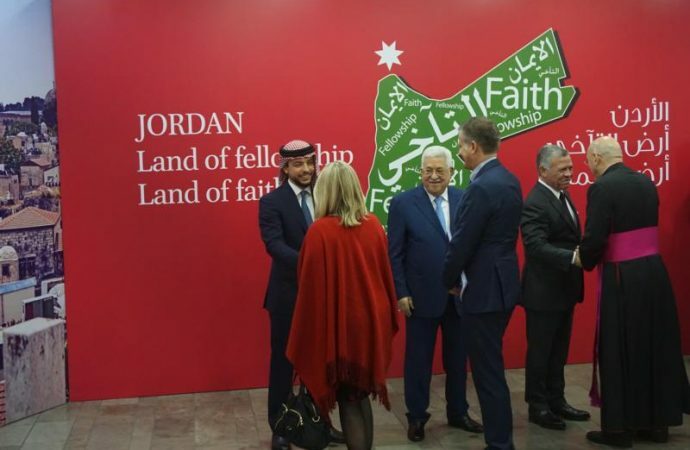 AMMAN, Jordan – As sectarian strife engulfs neighboring Mideast countries, Jordan’s King Abdullah II invited Catholic and other leaders to celebrate Christmas in the spirit of fraternity and harmony the holiday symbolizes. “And from Jordan it’s a message for the whole world: Jordan is always moderate in its religious points of view, and we have a very high level of interreligious dialogue. It’s a message against fanaticism, terrorism, and anyone who sees ‘the other’ as his enemy,” said Bader, who directs the Catholic Center for Studies and Media in the Jordanian capital. “This country, even if it is small in size, it is a cornerstone for stability in all the region,” Pizzaballa said. But the Jerusalem Latin archbishop and Greek Orthodox Patriarch Theophilos III of Jerusalem expressed concerns that Christians in Jerusalem face regarding Israeli policies on the future of church properties and school curriculums as well as vandalism carried out by Jewish extremists against churches.